National attention focused on Boston Saturday as protesters planned to fill the streets to pronounce their opposition to bigotry and racism a week after a white nationalist rally in Charlottesville, VA. Many were concerned that the protests in Boston would turn into riots, causing property damage and producing casualties. But after the marches concluded — more than 40,000 attended — those concerns seemed outsized. Boston's city government and police force had allowed for a poorly attended so-called "Free Speech Rally," which had ties to the white nationalist Virginia rally, as well as the counter-protests that far outnumbered the original event. 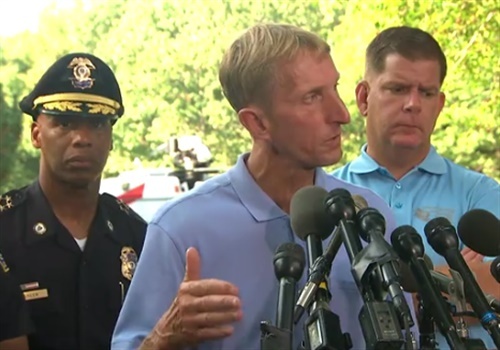 Boston Commissioner William Evans stated that "99.9 percent" of those in attendance were there to "fight bigotry and hate." He noted that there were only 33 arrests, no serious injuries, no significant property damage and said that everything went according to plan. The commissioner also explained a few of the strategies they implemented, such as keeping a 35- to 40-yard distance between the protesters and counter-protesters. They deployed bicycle cops and "peddled" 20,000 counter-protesters down the street toward Boston Common — the location of the rally.